While I don’t hear about it a lot recently these days, there are still some sites that I need OpenID to log in to. I had been using myOpenID from Janrain for this, but that service was retired. Unfortunately, So was my backup provider, ClaimID. Whatever OpenID provider you have, I highly suggest setting up delegation. OpenID delegation means you can use any website you control as your OpenID login. The delegate website is configured to use your chosen provider and you can switch anytime without having to update your login information on other sites. Replacing “mywebsite.com” with the site you want to act as delegate, and “myopenidprovider.com” with your chosen OpenID provider (e.g., openid.stackexchange.com). Make sure you have an account at the OpenID provider of your choice before doing this. If you have a self-hosted WordPress blog, you can use this plugin instead of editing your theme files. Thanks Aaron Parecki, Nicolas Ward, and Sumana Harihareswara ‏ for helping me compile this list. Know of an OpenID provider not already on the list above? Let me know in the comments! Recently I’ve been thinking a lot about how to make more time for meaningful project work as well as for rest. One way to free up time has been to significantly reduce the number of meetings I attend and facilitate, and to make those meetings as efficient as possible when I do attend. This post focuses specifically on better scheduling techniques. If you find it useful, you might also find Strategies for Facilitating Better Meetings useful. Idea 1: Only schedule meetings when there are no other effective options. Meetings take up a lot of time. An hour long meeting doesn’t just take an hour, it takes an hour per person who attends the meeting. There’s also an opportunity cost associated with meetings. When you’re in meetings, you aren’t getting any other work done. The opportunity cost is multiplied if you have work that that requires long blocks of uninterrupted time. On days where I an hour of free time interspersed between meetings are days where I completed nothing but superficial tasks. In general, always aim for fewer meetings. Before scheduling a meeting, ask yourself what the goal of the meeting is, and can that goal be accomplished in another, preferably asynchronous way. There’s a caveat to this idea, however. If while discussing a topic in an asynchronous channel and you realize going round and round without progress or are otherwise not making progress, it’s time to move to a synchronous channel. This might be a video or telephone call or an IRC chat. Idea 2: Schedule the shortest meeting possible. Think about your goal, the number of people attending and then pick a meeting length accordingly. Many people default to hour long meetings for no other reason than it’s the default of many calendaring tools, and we’re used to thinking in full-hour increments. Take a look at your agenda. Do you need a full hour to get through it? Would 30 or 45 minutes work instead? Treat people’s time as the valuable and finite thing that it is and only ask for what you absolutely need. Idea 3: Use a calendar tool to create and send a meeting invite. 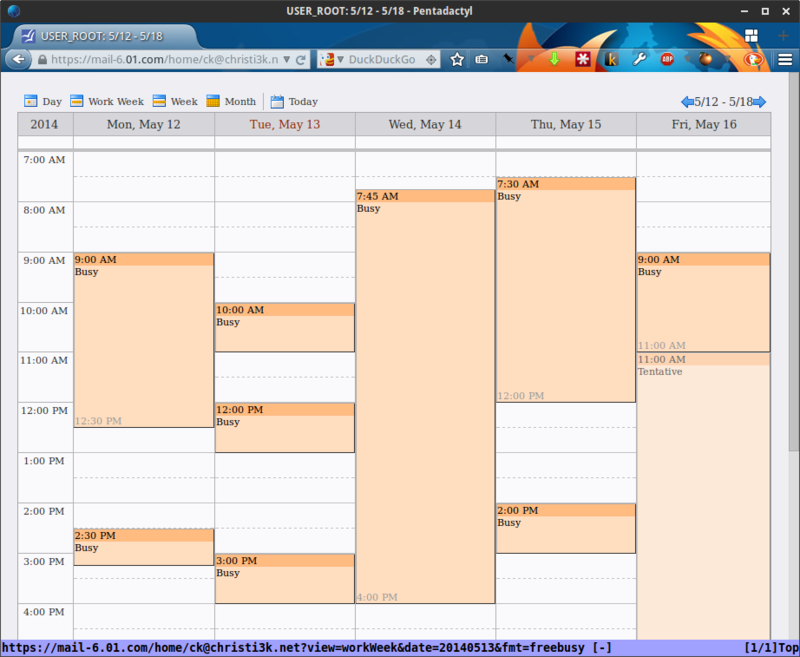 Zimbra, Thunderbird via Lightning, iCal, Google Calendar, Outlook. Most email clients have this built in, so you shouldn’t have to think too hard and nor should your recipients. If you’re self-hosting email or on an otherwise non-mainstream hosted email, you probably have enough technical savvy to figure out how to send a calendar invite. Why? For those of us who live and die by our calendars, if something is not on there, it isn’t happening. Or it is, but I don’t need to know about it. Sending a calendar invite bypasses my often overwhelmed email queue and gives me the opportunity to respond in a routinized way without having to get to inbox zero. Idea 4: Only invite those who really need to attend. 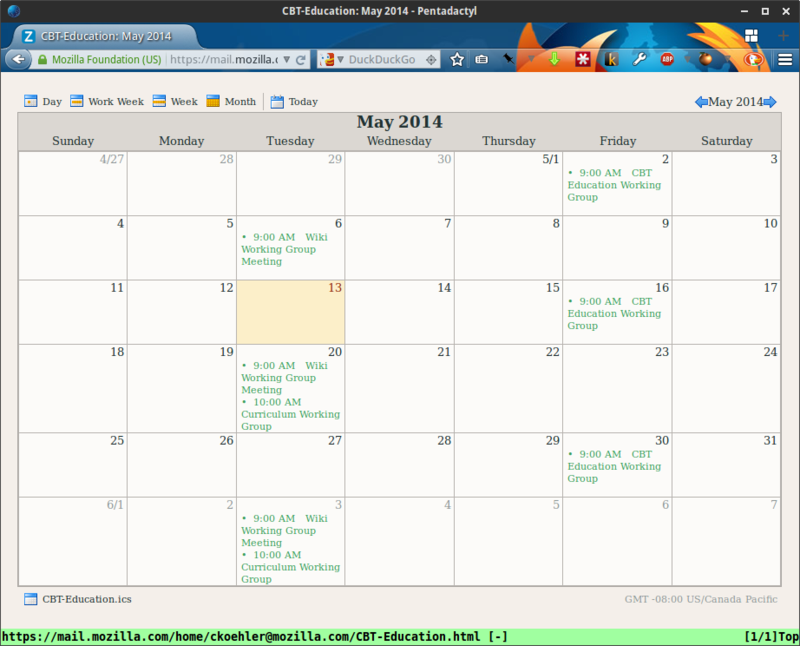 Call out attendees who are truly optional (many calendar tools have this feature, if not, use the invite body). Your agenda should give an good indication to invited attendees why they need to attend. Keep an eye out for acceptances and declines and follow-up accordingly. Don’t wait until the meeting has started to try and track down a necessary participant who didn’t respond to your meeting invite. Idea 5: Manage large, group meetings using shared calendars instead of individual invites. In the case of large, group meetings, I recommend using shared calendars instead of sending invitations to individuals or even groups of individuals. These work best for meetings where attendance is medium to very large, attendance is optional and variable, and the content of the meetings are largely updates with room for discussion. Using shared calendars allows people to subscribe to the calendars of events or groups for which they are interested in participating and gives them control over how to manage that information in their own calendars. 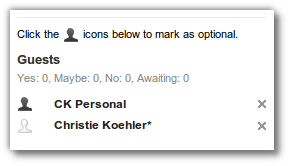 With a shared calendar, a person can toggle visibility and choose whether or not those appointments will affect their free/busy status without having to respond to individual invites. Sharing your own calendar allows others to initiate meetings with you without having to go back and forth via email asking ‘what time is good.’ Doodle and other websites accomplish similar things, but take time to setup. If you share your calendar publicly and let people know about it, they can compare it with their own schedules and send an invite for a time that seems to work for both of you. If the time doesn’t actually work for you, you can decline or respond suggesting a new time. You won’t necessarily eliminate the back-and-forth with this method, but at least you’re a step closer. When someone sends you an invite, your time is blocked as tentative and there’s less of a chance you’ll be booked for something just after you’ve told someone via email you were free at that time. I’ve chosen to share only the free/busy status of my calendar, so all you see are blocks of time say ‘busy’ and ‘tentative’ depending on how I’ve responded to appointments. For me, this is a good mix of privacy vs the convenience of easier scheduling with other people. What strategies do you have to make scheduling easier, better, more productive? Leave them in the comments. Or tweet at me. As part of the community building education efforts I’m leading at Mozilla, I’ve created a draft of an open planning checklist. The inspiration for the current content comes from our book Community Event Planning. I’ve modified it somewhat to be more Mozilla-specific. This is meant to be a quick reference, one that project leaders can read and understand quickly, and reference as they set up their projects. Please take a look at the draft on WikiMo and let me know what you think. For best collaboration, leave your comments directly on that wiki page. Otherwise leave a comment here on the blog, or visit my Mozillians profile for the best way to get in touch. 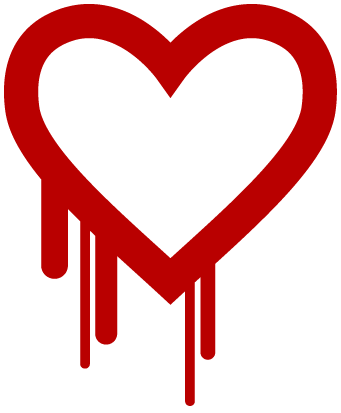 I’ve put this explanation together for those who want to understand the Heartbleed bug, how it fits into the bigger picture of secure internet browsing, and what you can do to mitigate its affects. When you are browsing a site securely, you use https and you see a padlock icon in the url bar. When you are browsing insecurely you use http and you do not see a padlock icon. Firefox url bar for HTTPS site (above) and non-HTTPS (below). HTTPS relies on something called SSL/TLS. SSL stands for Secure Sockets Layer and TLS stands for Transport Layer Security. TLS is the later version of the original, proprietary, SSL protocol developed by Netscape. Today, when people say SSL, they generally mean TLS, the current, standard version of the protocol. The TLS protocol relies heavily on public-key or asymmetric cryptography. In this kind of cryptography, two separate but paired keys are required: a public key and a private key. The public key is, as its name suggests, shared with the world and is used to encrypt plain-text data or to verify a digital signature. (A digital signature is a way to authenticate identity.) A matching private key, on the other hand, is used to decrypt data and to generate digital signatures. A private key should be safeguarded and never shared. Many private keys are protected by pass-phrases, but merely having access to the private key means you can likely use it. The purpose of SSL/TLS is to authenticate and encrypt web traffic. The digital certificate certifies the ownership of a public key by the named subject of the certificate. This allows others (relying parties) to rely upon signatures or assertions made by the private key that corresponds to the public key that is certified. In this model of trust relationships, a CA is a trusted third party that is trusted by both the subject (owner) of the certificate and the party relying upon the certificate. In order to obtain a valid certificate from a CA, website owners must submit, at minimum, their server’s public key and demonstrate that they have access to the website (domain). Encrypt in this case means “encode data such that only authorized parties may decode it.” Encrypting internet traffic is important for sensitive or otherwise private data because it is trivially easy eavesdrop on internet traffic. Information transmitted not using SSL is usually done so in plain-text and as such clearly readable by anyone. This might be acceptable for general internet broswing. After all, who cares who knows which NY Times article you are reading? But is not acceptable for a range of private data including user names, passwords and private messages. When you visit a website with HTTPs enabled, a multi-step process occurs so that a secure connection can be established. During this process, the sever and client (browser) send messages back and forth in order to a) authenticate the server’s (and sometimes the client’s) identity and, b) to negotiate what encryption scheme, including which cipher and which key, they will use for the session. Identities are authenticated using the digital certificates mentioned previously. When all of that is complete, the secure connection is established and the server and client send traffic back and forth to each other. All of this happens without you ever knowing about it. Once you see your bank’s login screen the process is complete, assuming you see the padlock icon in your browser’s url bar. Even though establishing an ssl connection happens almost imperceptibly to you, it does have an overhead in terms of computer and network resources. To minimize this overhead, network connections are often kept open and active until a given timeout threshold is exceed. When that happens, the connection is closed. If the client and server wish to communicate again, they need to re-negotiate the connection and re-incur the overhead of that negotiation. Keepalive functionality was added to the TLS protocol specification via the Heartbeat Extension. Instead of “Keepalives,” they’re called “Heartbeats,” but they do basically the same thing. Let’s pause for a moment to talk about specifications vs implementations. A protocol is a defined way of doing something. In this case of TLS, that something is encrypted network communications. When a protocol is standardized, it means that a lot of people have agreed upon the exact way that protocol should work and this way is outlined in a specification. The specification for TLS is collaboratively developed, maintained and promoted by the standards body Internet Engineering Task Force (IETF). A specification in and of itself does not do anything. It is a set of documents, not a program. In order for a specifications to do something, they must be implemented by programmers. OpenSSL is one implementation of the TLS protocol. There are others, including the open source GnuTLS as well as proprietary implementations. OpenSSL is a library, meaning that it is not a standalone software package, but one that is used by other software packages. These include the very popular webserver Apache. The Heartbleed bug only applies to webservers with SSL/TLS enabled, and only those using specific versions of the open source OpenSSL library because the bug relates to an error in the code of that library, specifically the heartbeat extension code. It is not related to any errors in the TLS specification or and in any of the underlying ciper suites. Usually this would be good news. However, because OpenSSL is so widely used, particularly the affected version, this simple bug has tremendously reach in terms of the number of servers and therefor the number of users it potentially affects. A client sends a heartbeat message to the server. The message contains two pieces of data: a payload and the size of that payload. The payload can by anything up to 64kb. When the server receives the heartbeat message, it is to add a bit of extra data to it (padding) and send it right back to the client. Pretty simple, right? Heartbeat isn’t supposed to do anything other than let the server and client know they are each still there and accepting connections. In the code for affected versions (1.0.1-1.0.1f) of the OpenSSL heartbeat extension, the programmer(s) made a simple but horrible mistake: They failed to verify the size of the received payload. Instead, they accepted what the client said was the size of the payload and returned this amount of data from memory, thinking it should be returning the same data it had received. Therefore, a client could send a payload of 1KB, say it was 64KB and receive that amount of data back, all from server memory. If that’s confusing, try this analogy: Imagine you are my bank. I show up and make a deposit. I say the deposit is $64, but you don’t actually verify this amount. Moments later I request a withdrawal of the $64 I say I deposited. In fact, I really only deposited $1, but since you never checked, you have no choice but to give me $64, $63 of which doesn’t actually belong to me. And, this is exactly how a someone could exploit this vulnerability. What comes back from memory doesn’t belong to the client that sent the heartbeat message, but it’s given a copy of it anyway. The data returned is random, but would be data that the OpenSSL library had been storing in memory. This should be pre-encryption (plain-text) data, including your user names and passwords. It could also technically be your server’s private key (because that is used in the securing process) and/or your server’s certificate (which is also not something you should share). The ability to retrieve a server’s private key is very bad because that private key could be used to decrypt all past, present and future traffic to the sever. The ability to retreive a server’s certificate is also bad because it gives the ability to impersonate that server. What’s worse is that logging isn’t part of the Heartbeat extension. Why would it be? Keepalives happen all the time and generally do not represent transmission of any significant data. There’s no reason to take up value time accessing the physical disk or taking up storage space to record that kind of information. Because there is no logging, there is no trace left when someone takes advantage of this vulnerability. The code that introduced this bug has been part of OpenSSl for 2+ years. This means that any data you’ve communicated to servers with this bug since then has the potential to be compromised, but there’s no way to determine definitively if it was. This is why most of the internet is collectively freaking out. What do server administrators need to do? Revoke and reissue keys and certificates for affected systems. When an encrypted connection uses perfect forward secrecy, that means that the session keys the server generates are truly ephemeral, and even somebody with access to the secret key can’t later derive the relevant session key that would allow her to decrypt any particular HTTPS session. So intercepted encrypted data is protected from prying eyes long into the future, even if the website’s secret key is later compromised. What do users (like me) need to do? The most important thing regular users need to do is change your passwords on critical sites that were vulnerable (but only after they’ve been patched). Do you need to change all of your passwords everywhere? Probably not. Read You don’t need to change all your passwords for some good tips. Additionally, if you’re not already using a password manager, I highly recommend LastPass, which is cross-platform and works on pretty much every device. Yesterday LastPass announced they are helping users to know which passwords they need to update and when it is safe to do so. If you do end up trying LastPass, checkout my guide for setting it up with two-factor auth. If you like visuals, check out this great video showing how the Heartbleed exploit works. If you’re interested in learning more about networking, I highly recommend Ilya Grigorik‘s High Performance Browser Networking , which you can also read online for free. Recently I upgraded my work laptop from Xubuntu 13.04 to 13.10. The upgrade went well, except for an issue with audio output from VidyoDesktop. Every other application worked fine. Skype, audio from Flash inside both Firefox and Chromium, gmusicbrower, Rhythmbox, and the system sounds all performed as expected. After spending a day spelunking the depths of PulseAudio, a co-worker pointed me to this bug report which links to this blog post about making Skype compatible with changes in PulseAudio 4.0. We’re using version 2.2.x of the VidyoDesktop client, which I believe has been superseded and so you may not need this fix at if you use a later client version.